Craig Jackson was already a highly experienced machinist and metallurgist when he happened to discover a love for woodturning back in 2001. Frustrated with the need to constantly resharpen conventional turning tools as well as climb the learning curve necessary to use them effectively, he applied his extensive knowledge and creativity to create a new kind of turning tool that everybody agrees is easier to use. Using replaceable carbide custom cutters that are hardened to Rockwell 93 hardness and machined with carefully designed bevel angles, Craig's tools make it incredibly easy to present an extremely sharp edge to a turning workpiece in a safe and effective manner. When one edge of the carbide cutter eventually becomes dull, the turner need only loosen a screw and rotate the cutter to a fresh sharp edge, then resume, saving the constant fuss and expense of machine sharpening. When all edges of a cutter have been consumed, the carbide cutter can be replaced for under $15. 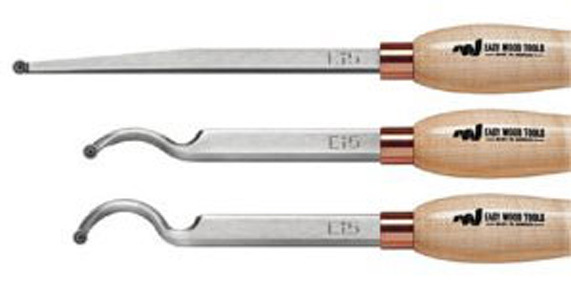 Easy Wood Tools has built some nice innovations into their new 1/8" parting tool. At the cutting end the tool body slims down to 3/32" and holds an 1/8" cutting tip. The narrow cutter helps you save material and part in very tight spaces. You can part up to 4" deep with only a 1/8" part width. The heavy tool body virtually eliminates chatter and vibration in most cuts. The solid carbide tip will stay sharp a long time. When it finally gets dull, it's easy to replace. Copyright © 2013 Highland Woodworking, Inc.